100 % pure, undiluted, organic oil. Wild oregano oil is obtained by steam distillation of wild oregano leaves (Origanum minutiflorum). Purpose: It is recommended for infections of urinary, gastrointestinal and respiratory system, as antioxidant and immunity boosting agent. The results of the research carried out by the Institute for Biological Research “Sinisa Stankovic”, University of Belgrade, March 2017. 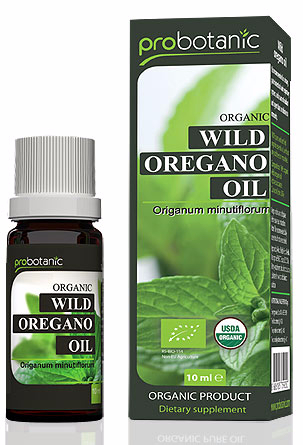 The results confirm the excellent antibacterial and antifungal properties of Probotanic wild oregano oil. Probotanic wild oregano oil ELIMINATES AND PREVENTES THE FOLLOWING GROWTH of the following bacteria and fungi. It is used ten days during one month: 3×2 drops per day. After a meal, diluted in a teaspoon of edible oil (sunflower, olive, coconut, linseed…). It is preferably that the treatment lasts 10-14 days : 2-3×1 drop per day. After a meal, diluted in a teaspoon of edible oil or honey. Mix the content well and then swallow quickly without holding it in the mouth. After that, a glass of cold water is recommended. In half a liter of boiling water add 1 drop of oregano oil and carefully breathe, with closed eyes. It is not recommended for children younger than 10 years and sensitive persons (asthma, allergies). Mix 30-50 drops of oregano oil with 100ml edible oil. Put on skin changes twice a day. The recommended daily dose should not be exceeded. The product is not recommended for pregnant and breastfeeding women, children under the age of 3 years, as well as persons hypersensitive to any of the ingredients of the product. The product should not be taken by persons who have: anaemia, coagulation disorder, swallowing disorder, severe hypertension, severe liver and kidney damage and persons on anticoagulant therapy. Possible side effects of the product are: delayed resorption of iron from the intestine, short-term and transient rapid pulse and heart beat (in persons who are sensitive to spicy food), feeling of burning in the oral cavity and stomach, increased menstrual bleeding. The product is not substitute for a varied and balanced diet. Before use, read the instructions carefully. Keep the product in a dry and dark place, at room temperature, out of reach of children. Lot number and expiry date are marked on the package of the product. Approved by the Ministry of Health of the Republic of Serbia – Decision No. 8643/2016 since the day 27.06.2016. Probotanic Oregano oil is made from Organum Minutiflorum, an endemic plant, which grows only on the Taurus Mountains in southern Turkey. It grows in less accessible regions. Exactly that kind of plant habitat is the basis for the scientific fact that Origanum Minutiflorum is the strongest kind of wild oregano ever found, with the highest percentage of the active substance – carvacrol. According to numerous studies, the essential antibacterial and active element of oregano is carvacrol. The higher percentage of carvacrol in oregano oil, the more efficient and valuable the oil shall be. Carvacrol is monoterpene phenol having powerful antiseptic effect. It acts by leading to decreased membrane potential, it damages respiratory chain of bacterial cells, prevents them from breathing thus resulting in the death of bacteria. Pack: glass bottle with glass pipette. Cardboard packaging. User Guide is in the box. In EU registered as dietary supplement. Proven antifungal effect of wild oregano oil on Candida albicans. Wild oregano oil against cervical carcinoma – cytotoxic effects of carvacrol, an active substance of wild oregano, on human cervical cancer cells. Effects of oregano, carvacrol and thymol on Staphylococcus aureus and Staphylococcus epidermidis. Wild oregano oil general information – scientifically proven beneficial properties, anti-inflammatory, antibacterial, antifungal and antiparasitic effects, dosage and safety. Effectiveness of wild oregano oil against bacteria Micrococcus flavus, Bacillus subtilis, Staphylococcus aureus, Staphylococcus epidermidis, Salmonella enteritidis, Salmonella typhimurium, Escherichia coli, Enterobacter cloacae, Proteus mirabilis, Pseudomonas aeruginosa, Listeria monocitogenes has been proven at the Institute for Biological Research “Siniša Stanković”.